I had a craving to do some baking while sitting at work today, so I decided to make a batch of chocolate brownies. I had some dark Moser Roth chocolate (from Aldi) in the cupboard at home, along with ground almonds, so I knew that I'd have no problems making them. 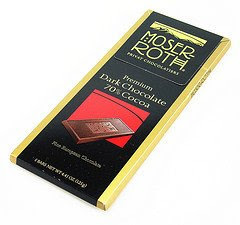 I particularly like this Moser Roth chocolate. Thanks to Aldi, it's great value and there is a fantastic orange and almond variety that I'm becoming very partial to. I'd recommend getting chocolate with a high cocoa content as there is enough sugar already in this recipe. Melt the chocolate in a bowl over some hot water. Cream the butter and sugar together and gradually incorporate the beaten eggs. While beating, slowly add the melted chocolate and vanilla essence. Mix in the almonds, salt, baking powder and walnuts. Pour into a lined and greased baking tin and bake at 180 degrees Celsius for about 30-35 minutes. Leave to cool in the tin and turn out when still a little warm.